Quite a lot of people spend more time at the workplace sitting on a chair than any other thing. This is usually for up to 5-8 hours in a day. Doing this every day may seem quite unavoidable as most office works demand such level of sitting commitment. However, as harmless and passive as sitting may seem unlike running a marathon, it eventually leaves strain on the spine when it goes on and on for a very long time. The sedentary work nature of many jobs have been a major problem for most employees and office workers because it has been found to promote series of health complications especially when the right technology tools are not properly invested into so as to avoid this. Thanks to technology, highly sophisticated chairs unlike most traditional chairs have been developed with a lot of amazing features to help reduce instances of health complications which may arise as a result of a highly sedentary work. Therefore, for this set of people who sit for such number of hours at work, having an ergonomic chair is a valuable investment they should never neglect. A high-quality ergonomic chair which is well designed with great features to provide comfort and improve posture is very essential. An ergonomic chair offers the option to choose and maintain a healthy workstyle and improve your sitting posture as it takes into account the shape, health and comfortability of the user. Back pains to which many other serious health issues have been associated with can be avoided if these chairs are efficiently maximized. It is too much of worry to work for a lengthy time and yet have to nurse body pains at the end of the day’s work. Therefore, investing into ergonomic chairs brings in benefits which are innumerable. Best of all, it helps you to achieve a healthy lifestyle at work and ultimately in your goal of having a long life. Yes, it is as good as that. It has been discovered that working while sitting in the right ergonomic chair boosts productivity up to 17%. Achieving your daily milestones and working effectively at your work place is directly linked to your optimum wellbeing and right state of mind. Without this, it is almost impossible to achieve an inch of productivity no matter how. One of the biggest threats to productivity is employee’s absence from the workplace which is usually as a result of injury. It is easy to think that all of such injuries probably resulted from falling or sliding but are rather as a result of consistent daily strain and pain. In fact, it has been discovered that most workplace injuries up to 40% were sustained from repetitive form of sprains and strains. This is the more reason why CEOs of most companies are now deliberate about having their employees make use of new office technologies such as ergonomic chairs as they have been found to be of great health benefits and pivotal to achieving maximum productivity at works. All these above were emphasized so as to let you know that your decision to get an ergonomic chair is definitely a great move. You will be amazed at such amazing effect it would do at your workplace. However, going through lists and shopping catalogs may be quite much of a work and getting the best chair at an affordable price at times seems like a one in a million chance. The Autonomous ErgoChair has been designed to meet all your ergonomic needs and has been proven to be the best modern ergonomic office chair out there. 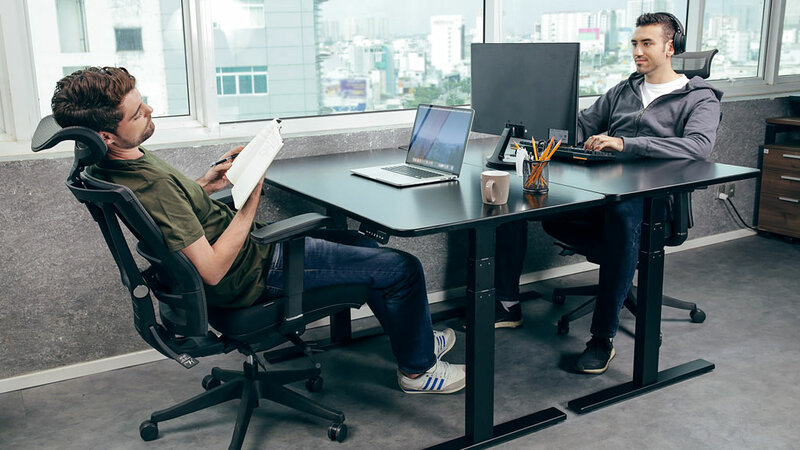 It is designed with amazing features which makes it a good office companion, a perfect substitute for traditional sitting chairs, and the best tool for achieving a healthy workstyle. You will find out more below about what really makes this chair the best and the perfect fit for every workplace today. The ErgoChair by Autonomous is about the only chair which features a simplistic and definitive design all in a bid to provide the perfect balance for your sitting posture and comfortability. The breathable Korean mesh at the chair back gives a cushioning effect to your back and helps prevent soreness and pain. It also allows fresh air to reach your back and reduce sweat. One of the first noticeable feature of this chair is the quality of the materials from which it was built. It has been fashioned with a good blend of materials which make it to be rugged and agile. It is built with high quality polyester fabric from Korea which lends to it its durability. It is also made with a molded foam interior and a durable nylon plastic frame aimed at offering you a combined mix of comfortability as well as long term of use. There are therefore zero worries of whether the chair is going to last for years or not. The chair can also carry heavy weights and withstand long period of time of rugged or harsh use. This chair features a tilt tension mechanism which allows you to adjust and tune your body mass so as to give you the best reclining. Having excessive weight at one side of the chair is not something that should be tolerated when sitting on a chair. Therefore everything must be balanced especially when you are leaning back on the chair. The tilt tensioner is controlled with a small sized knob which is just beneath the chair on the right side. This amazing feature hence helps you to achieve that by turning the tilt tensioner knob either clockwise or anticlockwise direction so as to reduce pressure and hence increase the resistance of the back. If you are looking for a chair which offers much flexibility at every angles, you should definitely go for this chair. It also offers you the choice of locking in at a reclining position. With this chair, you can use different sitting positions even while enjoying its ergonomic benefits to the fullest. This chair can be switched to different angles for flexibility and has been designed to adapt well with respect to ergonomics to any different sitting position. The chair is exceptionally built to help improve proper blood flow and circulation by helping you achieve a good sitting posture through flexibility. As cheap as this may sound and as expected it is for ergonomic chairs, you will be surprised that not many chairs feature this. However, the ErgoChair is fully adjustable which really makes it a one size fits all kind of chair. This amazing feature helps you eliminate every worry of whether the chair is going to fit your shape or size or somewhat customizable to your taste. It allows you to adjust the height and set it in such a way that it fits your body shape. This implies that the tendency of developing lower back pain and straining your back when you work can be almost totally reduced. Maintaining a good posture is important while sitting in the chair. Therefore, sitting in a slouched posture is a fast track to developing health complications especially on the lumbar part of your back. Chronic lower pain is a problem for a lot of people at the workplace today due to long hours of sitting in a chair with no adjustable back or lumbar support. The antidote to this is in the lumbar support feature of this chair. The Lumbar support is fully adjustable and can be set to adjust the chair to fit the position of your back. If you are working for long hours, you wouldn’t have to worry about developing pains in the lumbar region of your back as the lumbar support of this chair has got you covered. The control handle which is at the chairs lower back is pulled down to unlock the lumbar support and hence fit rightly to your back for extra comfort. Interestingly, this is also not a feature you would always see on every chairs not to even mention if it will be adjustable. As basic featuring a headrest may seem, you must know that it is also an important part of the chair which works wonders on your neck region. This chair features an adjustable headrest which helps to prevent any tendency of developing a stiff neck while sitting and working in it. One of the last parts of your body you would want to have pains however minimal is your neck region. It is definitely not a palatable experience because of the excruciating pain that accompanies stiffness in the neck especially when you have to struggle to turn your neck. This chair therefore takes this into consideration by featuring this headrest which is adjustable to support perfectly your neck anytime you rest your head on it. Yes, most ergonomic chairs feature armrests but not all of them are adjustable. This chair features adjustable arm rests which are important for support and relaxation. The arm rests offer support to the shoulders and helps to remove any tendency of strain or pain on the arms. This chair’s armrests are fully adjustable to achieve a comfortable degree to give your shoulders a relaxed posture while you sit and work. These armrests can also be adjusted in width such that you can reduce or increase their distance to your body. This is particularly important as it makes it usable for people irrespective if their size and body shape. However, these armrests can be removed from the chair because of users who do not really fancy having them attached to the chair. This chair features an adjustable seat pan depth adjustment to help put balance between your hip and your legs. This is particularly essential because it determines how optimally the blood would flow to and fro your legs. When the feet are not comfortable resting on the ground while you sit and work, soon you will begin to feel numbness due to the fact that your legs are not properly inclined to help smooth blood flow. When you use the height adjustment feature of this chair, you would be able to adjust your height such that your knees are few inches below your hip as your feet rests on the ground comfortably. In addition, you can adjust your height to achieve a straight focus on the screen of the monitor without having to twist your head up and down every time. Also, the seat pan adjustment helps to give strength and support to your thigh. It helps you to adjust the height and depth of the chair’s seat so as to achieve a distance between 1-4 inches between the tip of your knee and the chair. This would therefore ensure that there is enough support for your legs and hence helps to avoid numbness through proper blood flow. Most chairs out there with claims to be ergonomic are usually too costly and pricey. The frustrating part of it is that they are not usually as ergonomic as they claim to be and are neither long lasting or durable. You may usually have to buy another just after a short period of use due to breakdown or low functionality. However, the ErgoChair comes at an affordable price of $299 despite the amazing benefits it features. The Autonomous company also offer warranty which covers all manufacturing defects. The ErgoChair is really a very formidable office companion and modern technology innovation for every workplace. It is a proof that living a healthy work style can be chosen and poor sitting habits along with several health complications can definitely be avoided. The truth is, it is almost impossible to get any other chair which offers several ergonomic benefits as this and at an affordable price. This is all the more reason why it is the best ergonomic chair and the perfect fit for every workplace.